When Hike it Baby started it was all about babies. We were a small group of mom’s who headed out on trail to escape sitting inside in the middle of summer. We walked, we talked and every week we grew and so did our children. From moms and babes we quickly expanded to dads, partners and then there were grandparents, aunts and uncles, foster parents and one day we looked around and babies were toddlers, then kids. Now in less than two years we are a family organization growing faster than a sunflower sprouting in the hot summer sun. 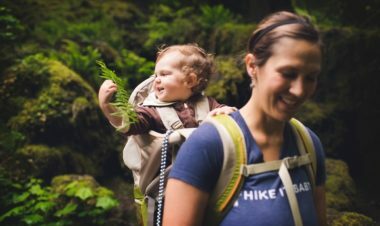 Now many of us who started hiking with our infants have toddlers. 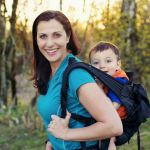 So here are a few tips we’ve pulled together to help you as your little one ages up and you are looking for safe trails for that transitional phase or if you have two kids (a new baby and then a roaming toddler or little kiddo). 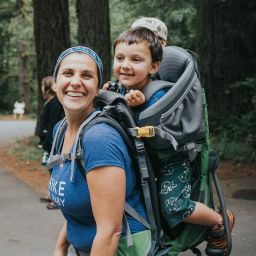 Having a little walker doesn’t mean you have to stop getting out there, you just want to think a little more about the trails you are heading out on to. 1. Look for parks with loops so that it’s fun for you even if it’s short. Out and backs are ok, but loops keep it more interesting unless the views are amazing. 2. Think about how long your kiddo will let you carry him or her. Is it 5 minutes or 45 minutes and plan around that. Think shorter and more play time vs. trying to really get to a destination. 3. If you have a child who will let you carry you can consider trails with drop offs as long as there are good walking bits for him/her to be let down. 4. Flat trails can be fun if you find interesting things in it. We recently hiked a park that had a campground and picnic area all around it so there were lots of water taps for kids to stop and play with every 10 minutes or so. That was great on a hot day. 5. Animals are awesome! Nature preserves with turtles, ducks, woodpeckers, robins, snakes and other critters cruising about can be so exciting for a kid. Early in the morning before things heat up is the best time to find animals. 6. Railings are key. If there are drop offs on the side of the trail it’s great when a trail has some kind of guard rails. This can give you an extra moment when you have an escape kiddo. 7. Consider a harness system like the one we sell on Hike it Baby. 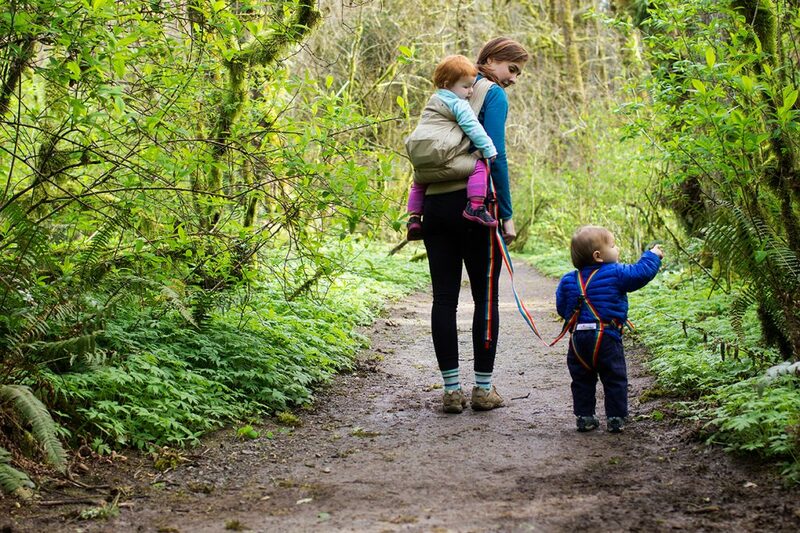 The idea of a “leash” makes some people squirm but if you are near water or cliffs letting your toddler or kiddo roam a bit while you remain safely behind him/her can offer them a lot of opportunity to make good decisions while you don’t have to feel nervous. This will allow you to go on steeper trails. 8. Look for fun features like small waterfalls trickling down hillsides that kids can put their hands in and go under. Even if it’s just drips. 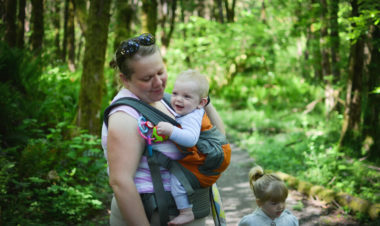 This can stop a fussy toddler in their tracks and adjust the mood of the hike. 9. Find trails that are less busy so your kids can roam without “bothering” runners and dog walkers. It’s nice for kids to have freedom when they are “exploring” hiking in the early stages. 10. Starting on trails that are flatter with maybe slight hills here and there will help build confidence for both of you. 11. Carry snacks and little toys. These can help make a momentary tantrum disappear quickly. 12. 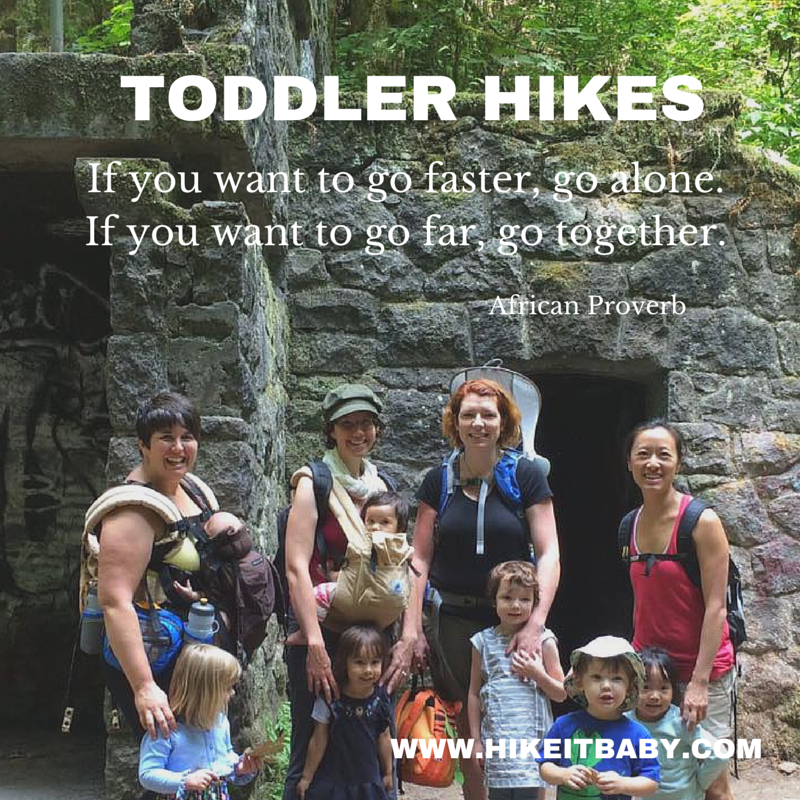 Hiking with other toddlers can make all of the difference in the world in keeping kids going. 13. Find a walking stick or other “nature toys” like a fern (yes we know this isn’t leave no trace) or some flowers or leaves. 14. Be understanding if your little one just isn’t into it. You may have had your heart set on seeing a waterfall or an amazing view but adjust. Look around where you are at and see what you can seize in the moment for amazing experiences. 15. Plan a shuttle or pick up if you are going for a long hike. You never know when that meltdown will come and how bad it will be. Toddler times can be trying times for serious hikers. But they can also be an opportunity to slow down and look at the world around you. Think of it like riding a bike to get somewhere instead of driving a car. Your bike ride will often be a more pleasurable experience because you are “feeling” where you are going instead of just driving and arriving. 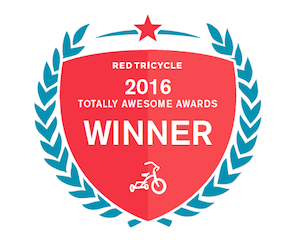 Let your toddler help you really experience the trail and look at it in a different way. This time will pass quickly, so enjoy the moment while you can. 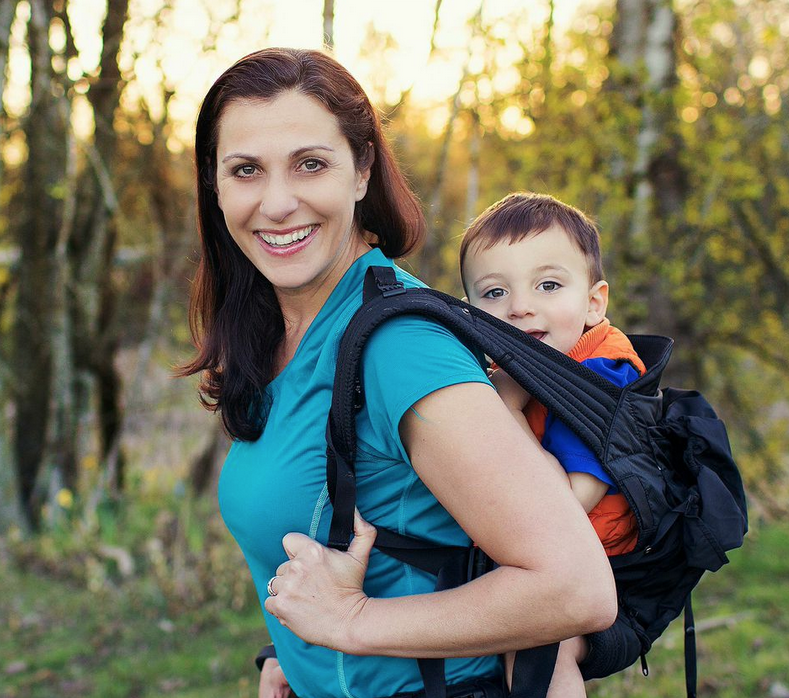 Shanti Hodges is the Founder of Hike it Baby and Mama to 2-year-old Mason River. 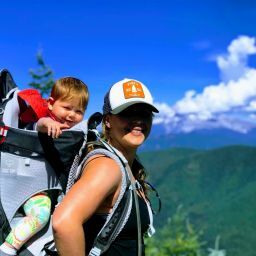 She’s always been a fast person so having a child has helped her view time on the trail in a whole new light. Hike it Baby 30 June Challenge – Biggest Group Yet! Pretty much all our hikes are toddler led these days. She insists on walking, so we just do short loops and try to just enjoy rather than trying to get up a good pace or anything. It is frustrating sometimes, but I do love getting to see her enjoyment of nature. Where can I buy the leash from this picture?! Thanks! !